This lovely table used to belong to my Gran Nora and it was in her dining room. We recovered the chair pads in gorgeous stripey ticking. 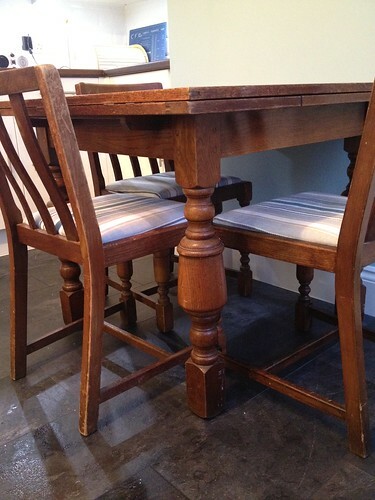 The table and chairs are slightly battered but I love that and have no intention of doing any more refurbishment. I really like the fact the all the nicks, scratches and grazes show the history of the furniture. 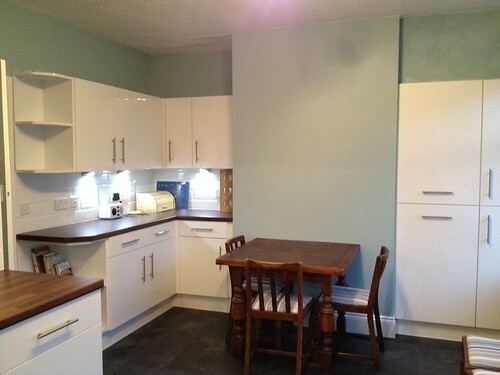 I think that it now goes beautifully in our lovely shiny new kitchen. This is actually a photo from yesterday. My cousin’s wife came over with her little girl Clara who is 4 days younger than The Little Mister. They lay quite happily together under his activity mat and watched the animals. It wasn’t too long before Edward dropped off to sleep! Growing up in Guernsey meant that I had a ready supply of playmates, including Clara’s Dad and I hope that our children will grow up with the same companionship, freedom and fun that we had the pleasure of experiencing. Today is The Mister’s birthday. Sadly he had to work this morning but this afternoon we ate a birthday cake and chilled out. The Mister is a superstar – a brilliant husband and a fabulous Dad and I am very grateful that I have him in my life. Buying presents for him though is a nightmare – he never knows what he wants so I ended up buying him a few bits and pieces but nothing terribly exciting. We were going to go out for dinner bur The Little Mister has typically been waking up just about tea-time so instead we ordered a Chinese and stayed in with a nice bottle of wine. Is this now our future? This is The Mister with his present from my parents. 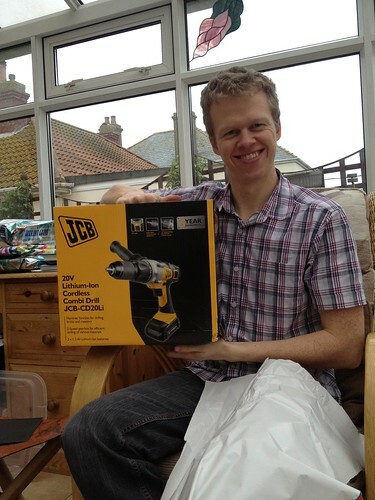 He was tragically happy with his new drill! 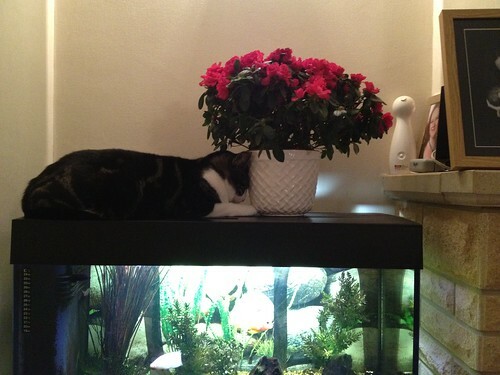 Billy the cat spends a lot of his time sitting on top of the fish tank. It is lovely and warm and every now and then the fish get fed through a little hatch in the top and he can look through, and even drink out of the tank and dream about eating the fish. He was less than amused when Mum put a plant on top of it and he appears to be expressing his disappointment by butting his head up against it as tight as possible. Stupid cat. The Mister has been working today so this afternoon Mum and I went to the house with The Little Mister and then she took the buggy and walked home with him whilst I cracked on sorting out the kitchen. I pretty much managed to get everything done. Most things are in cupboards, I scrubbed the floor and even dragged the furniture in. The only thing left to add is a gorgeous oilcloth tablecloth that I bought. The table used to belong to Gran Nora and lived in her dining room. We covered the chairs a while ago and I think they look fabulous. I am so happy with how it is looking now! Today The Mister and I spent nearly all day at the house. 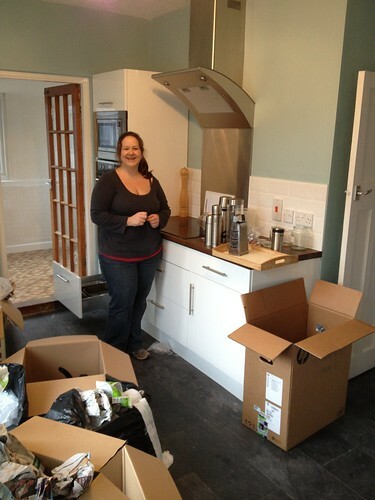 The Mister was painting the utility room and I was touching up paint in the kitchen and then unpacking boxes. I reckon at least a third of all our boxes are kitchen stuff so it feels like a massive milestone now these are being unpacked and put away. It is starting to feel real and that’s very exciting! Today we went for a walk to Vazon beach for lunch at the new cafe and then The Mister’s parents flew home today. It has been lovely to have them here and it is such a shame that they don’t live closer. We will try and Skype them regularly so that they can see The Little Mister live. We will no doubt see them soon as we intend to have a christening in April. 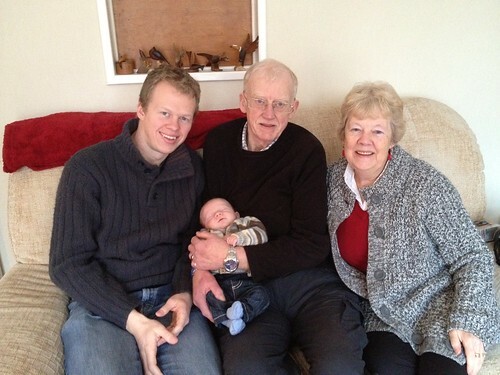 I love this photograph – three generations of the family together. Today is the last full day that The Mister’s parents are on the island. 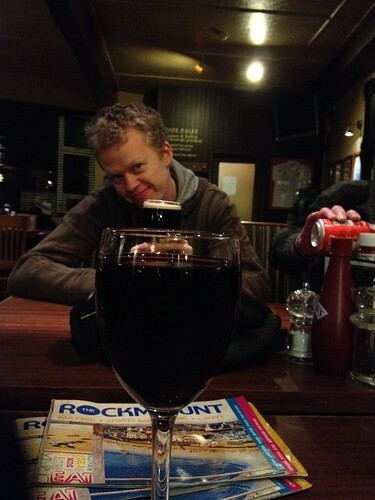 We went for a walk this afternoon and tonight we went to our local pub for a meal. The Little Mister, as ever, woke up just as my meal arrived. Fortunately I had chosen finger food (AKA scampi and chips) which meant that I was able to feed him at the same time as eat my dinner. Washed down with a delicious glass of wine! It has been a lovely week but I have to admit that I am really looking forward to getting on with moving into our house. We should be in very soon so watch this space. Hurray! Grandma Beryl has been very busy since she arrived in Guernsey. She has been doing plenty of cooing and cuddling the baby and she has been knitting! 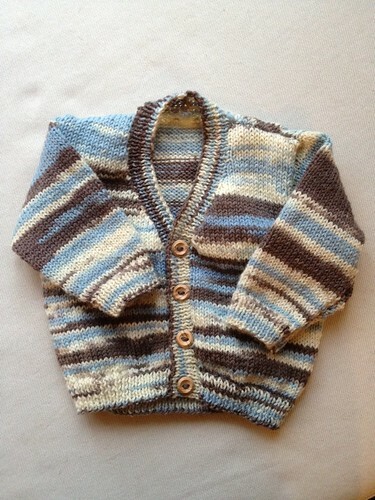 She brought two gorgeous cardigans with her for The Little Mister and she completed this one for him whilst she was here. I think it will look really cute with little jeans. Lovely.